German mosques are rarely impressive and grand. Islamic houses of worship are often hidden away in a rear courtyard in an industrial area and look nothing like the imposing structures so familiar in predominantly Muslim countries. 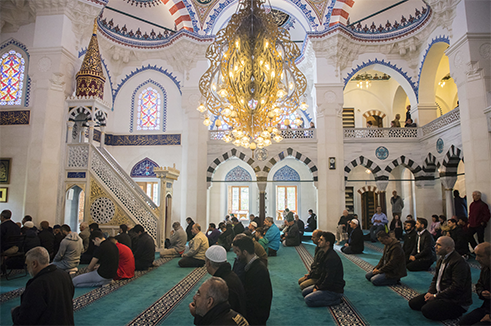 Of the approximately 2,800 mosques and Islamic houses of prayer in Germany, only 350 are immediately recognizable as such thanks to their Turkish-Ottoman architecture with the typical cupola and minarets. The others have forgone these distinctive elements, which are optional, contrary to popular opinion. The only rule a mosque must fulfil is its alignment towards Mecca. 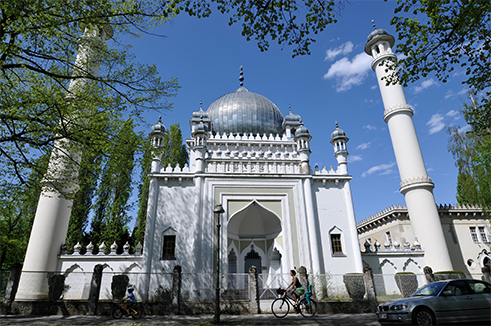 German mosques tend to be nondescript in part because of the continuing distrust and hostility with which many Germans view elaborate mosques in the style common to Muslim-majority countries. Fearing supposed Islamization, they oppose richly embellished Islamic buildings that would have a powerful visual impact on the cityscape. On the other side of the issue, many Muslim communities would like to emerge from a shadowy existence in rear courtyards, a location that does not encourage trust. They see raising the visibility of mosques as part of the urban landscape as a question of integration, and base their calls for inclusion on pride in their Muslim identity in a new homeland. They identify with the country in which they live, and are demanding an equal place in German society. In addition to the innumerable backyard mosques, there are also a number of larger buildings in with space for more than 1,000 or more worshipers in German cities such as Duisburg, Mannheim, Cologne and Bremen. In most cases, construction did not go particularly smoothly. Muslim communities have often had to forgo architectural elements such as minarets, ornamental facades and cupolas, although these are just as important to Germany’s predominantly ethnic Turkish Muslims as the presbytery, crypt and chancel in churches is for Christians. This has been in response to the general public’s reservations about the role of Islam in Europe, which have recently grown even stronger in the wake of terrorist attacks in Europe. It often begins with objections from local residents concerned about possible noise pollution - the call of the muezzin can now be heard from some 30 mosques, at least during the day - and often leads to a fierce dispute over the structural height of the minaret towers. Planning and building mosques is often tense and contentious, and put relations between Muslims and the non-Muslim majority to the test. Discourse about mosque architecture is also about the form Islam should take, whether it should adhere to its original concepts, or align more with the practices of Muslims influenced by the West. Perhaps it goes even further, and is really about assimilation and creating a bond with the new homeland through mosques that completely conform to Western architectural ideals. Currently Euro-Islam architecture, a school of design that expresses a secularised form of Islam in Europe, is seen as a generally acceptable compromise. This Islamic movement seeks to harmonize the rights and duties of Islam with European values, and eclectic designs are often brought together to create a modern architectural style. 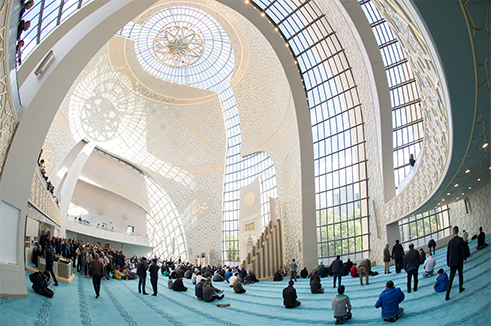 Many new buildings and designs are built under the precept that a house of worship should also serve as an inviting place for interfaith interactions. The fascade of the central mosque in Cologne: Public controversy erupted over the building's design and the height of its minarets. 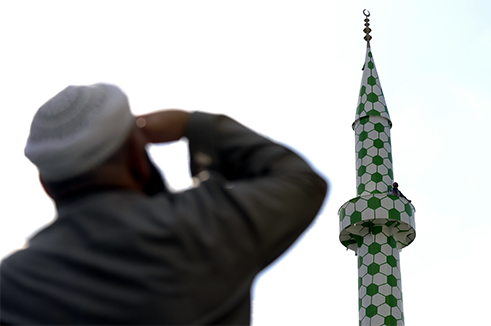 | Photo (detail): © picture alliance / Rainer Jensen / dpa The prestigious Central Mosque in Cologne is a prime example of modern Euro Islam architecture. It features a Turkish-Ottoman cupola and the interplay of concrete and glass wall elements creates a transparent structure. People inside can look out, and those outside can look in, an invitation for open interfaith dialogue. At the heart of the building is a wide outdoor staircase leading up into the 36-metre-high hall topped by a cupola and with curved concrete walls and glass facades. It holds around 1,200 visitors. The staircase design is an architectural reminder of the intercultural character of the mosque. Project head Selim Mercan wanted to combine Oriental elements with a modern Islam that fits into the cosmopolitan city of Cologne. He points to the round ceiling ornamentations with Arabic inscriptions in gold leaf dedicated to figures such as Abraham, Moses, Noah and Jesus, who are important for Christians, Jews and Muslims alike. “The symbolism is nice,” the civil engineer says. Still, critics of the central mosque have accused the builders of a lack of imagination, as the impressive cupola and minarets can also be interpreted as directly linked to traditional Ottoman architecture. In Cologne, there was a lot of public discourse during the construction phase, some quite heated. The height of the two minarets was a huge point of contention. At 55 metres, they are around a third the height of Cologne’s 157-metre cathedral that serves as the benchmark for all buildings in Cologne. 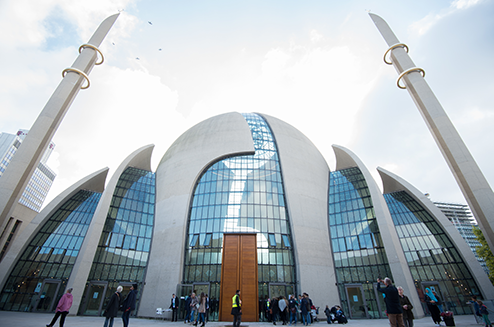 Ultimately an image campaign was started to raise support for the controversial construction project under the “Our mosque for Cologne” motto and engender a collective sense of interreligious community. In the Upper Bavarian town of Penzberg, another mosque project was completed with a little more tact. In the small city near Lake Starnberg, the multi-ethnic Muslim community erected a simple building in keeping with Modern aesthetics. 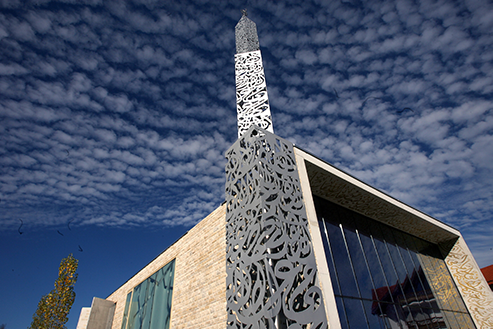 Only 15-metre, stainless steel minaret marks it as a mosque. The entryway is engraved with verses from the Koran in German and Arabic and complies with the formal elements of Euro Islam architecture. 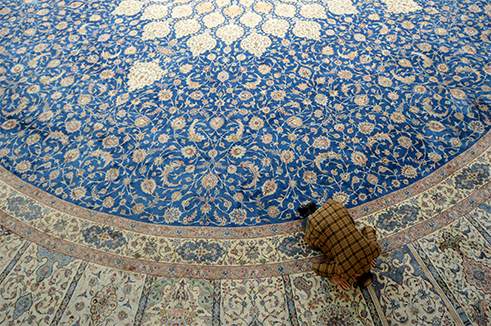 The prayer room of the Penzberg Mosque is bathed in azure light streaming in through the dark blue, shimmering facade made of thousands of shards of glass. | Photo (detail): © picture alliance / Frank Mächler / dpa The architect of this modern mosque building, Alen Jasarevic, is convinced that a central European mosque style is emerging that both Muslim migrants, especially in the third and fourth generations, and non-Muslims will find it easier to identify with than the more traditional mosque structures from the Islamic world. Jasarevic believes that the mosque and synagogue will soon join the church and the town hall as natural and integral parts of our cities. 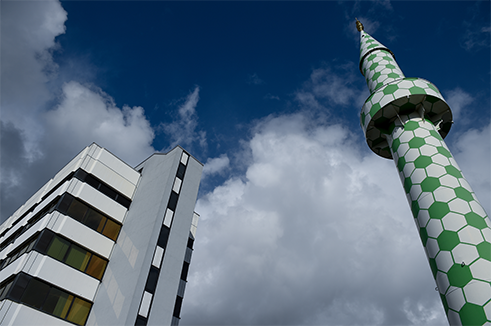 Germany's oldest mosque is nestled among blocks of flats in Berlin's Wilmersdorf district. In 1924, German architect Karl August Herrmann took his inspiration from the Taj Mahal in India. It is the largest Islamic house of prayer in Berlin and can hold up to 1,500 people. In the 1960s, the first construction projects that brought Ottoman architecture to Germany were generally designed by non-Muslim, German architects. These include the Bilal Mosque in Aachen and the Imam-Ali Mosque in Hamburg pictured here. Both are conservative in style. To a large extent, the German architects designed what their clients wanted, incorporating few of their own ideas out of respect for religious beliefs. Additional examples of these more classical mosques can be found in Lauingen, Pforzheim, Wesseling, Marl, Darmstadt and Berlin, as in the Sehitlik Mosque shown here. Their design does not represent a departure from tradition. In 2009, German- Turkish artist Boran Burchhardt redesigned the minarets of the Hamburg Central Mosque on Steindamm to much public fanfare. At first glance, the green and white hexagonal pattern on the newly decorated towers seems in tune with typical Islamic design. The colour green commemorates the Prophet, and the hexagon is a traditional shape used in Islamic ornamentation. But the hexagons also allow for another association and the pattern reminds many of a football. This ambiguity was intended: "It plays on a false association that is just as quick and automatic as linking mosques with terror," Burchhardt explains. 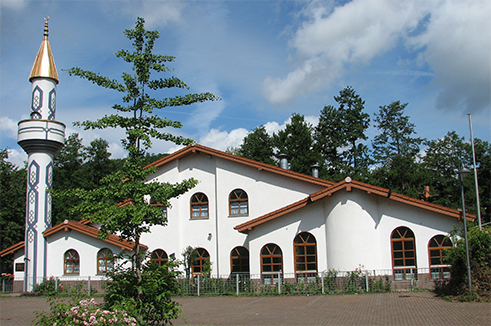 The mosque in Mosback in the state of Baden-Wurttemberg is a typical example of Euro Islam architecture, and incorporates local structural design with Alpine influences. The result is an innovative building in harmony with its surroundings. The construction of the new Central Mosque in Cologne is a clear indication that mosque architecture has outgrown the rear courtyard. Inside 1,800 stucco slabs create a geometric pattern on the walls, and an enormous chandelier features Arabic calligraphy. 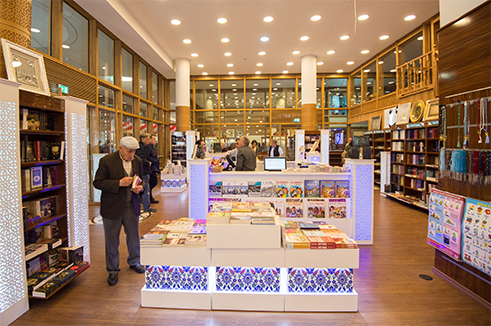 This mosque in the Ehrenfeld section of Cologne offers both prayer rooms and retail space.